This is a nifty website I use to estimate taxi fares whenever I feel the need to cab around. As the site is entirely in Japanese, I’ll do a little guide for non-Japanese speaking users. Fortunately, as the estimator uses the Google Map engine for routing, you can enter the locations in English as well. 出発地 = Location where you will start the journey. 経由地 = Any place that you may wanna swing by, e.g. to pick someone up along the way. 深夜割増 = Late night charge if you are intending to take a cab between 10 PM and 5 AM. 高速道路を使う = Do you want to use highways/expressways? 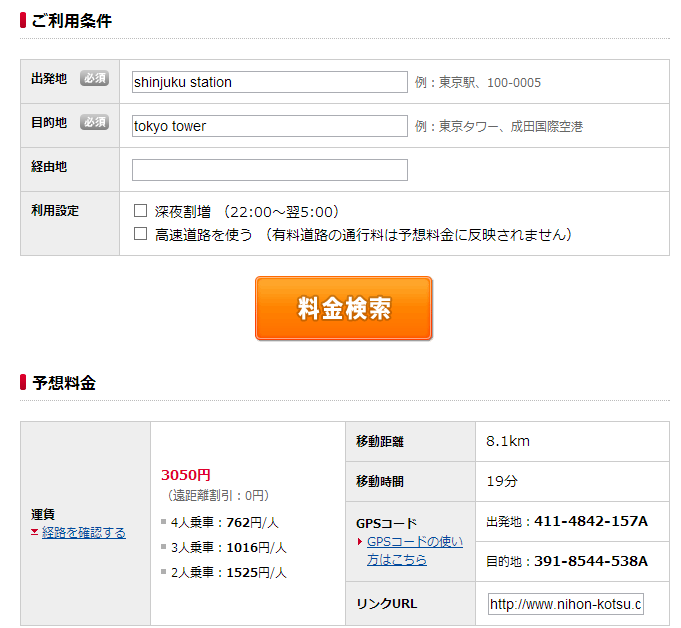 As you may already be able to make out, the above example shows that it costs 3050 JPY to travel from Shinjuku to Tokyo Tower. The distance by road is 8.1 km and the journey takes approximately 19 minutes. The site also conveniently breaks down the cost for each passenger if there are 2-4 people sharing the ride. Note, however, that taxi fares are pretty high in Japan and unless you are loaded, you might wanna skip taking a cab from Narita airport to Tokyo city center as that is likely to set you back around 200 USD!